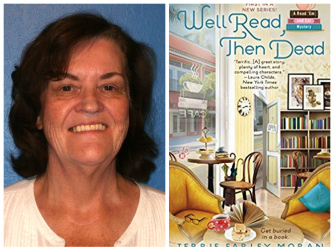 Please join us on Wednesday, February 20 at 6 pm to hear author Terrie Farley Moran talk about her "Read 'Em and Eat" cozy mystery series, which is set in Fort Myers. After her talk, Terrie will be pleased to sign copies of her books. At Fort Myers Beach’s Read ‘Em and Eat bookstore café, best friends Sassy and Bridgy dish about books, serve food, and solve mysteries. The "Read 'Em and Eat" mystery series consists of Well Read,Then Dead, Caught Read-Handed and Read to Death. All books are published by Berkley Books/Penguin Random House. Terrie also has co-authored the last three books in the Scrapbooking mystery series with Laura Childs. The latest volume, Glitter Bomb (#15), is set in New Orleans. Terrie, who has been short-listed twice for The Best American Mystery Stories, says the only thing she enjoys more than wrangling mystery plots into submission is playing games and reading stories with any or all of her grandchildren. Nestled in the barrier islands of Florida’s Gulf Coast, Fort Myers Beach is home to Mary “Sassy” Cabot and Bridget Mayfield—owners of the bookstore café, Read ’Em and Eat. But when they’re not dishing about books or serving up scones, Sassy and Bridgy are keeping tabs on hard-boiled murder.